Super quilt block designers Joanna and Julianna thought up a great theme for a quilt-a-long: sewing themed block designs using text fabrics that are so popular right now, Sew Out Loud! And they were sweet enough to let me design a block for it. Thank you, ladies! All the measurements given are height x width. You will need to add a ¼” seam allowance to all the printed pattern pieces. When I give measurements for fabric a ¼” seam allowance is included. Finished size of the block is 12” square (12.5” unfinished). When you look at the block you can see it is made up of 6 strips. Here is a photo of the strips before I sewed them together. First I’ll explain strip 2, the roof of the market stall, because you’ll do freezer paper stenciling using fabric paint that can dry while you make the rest of the block. Print the pattern for the roof (page 2) on the paper side of the freezer paper. It is possible that on some printers one of the bottom corners doesn't fit on the page. This shouldn't be a problem: just extend the lines with your ruler when you are at the point of cutting the fabric. Using your craft knife carefully cut out the letters from the paper. Start in the corners to get sharp corners. Also cut away the shape of the letters from around the insides of the A, B and R. Cut out the roof shape. Keep the piece of freezer paper that is above the roof shape. For the roof you need 4” x 11” of fabric. First take the piece of freezer paper that was left after cutting out the roof shape (or any other spare piece) and iron this onto the back of the fabric to stabilize it. Now take the roof shape and place it onto the front of the fabric, place the insides of the A, B and R in the right spots. Now carefully place the hot iron on top, do not move the iron around. Carefully press the roof and letter insides until they stick to the fabric. Check that all the edges are melted to the fabric. Let everything cool off. Now take your fabric paint and paint brush and with a little bit of paint at a time fill in the letter shapes. Don’t let the paper get soaked, work as dry as you can. Move the brush away from the edges of the paper to get sharp letters. When the letters are filled in, let everything dry (look at the instructions on the paint to see how long). Don’t take the paper off yet! Now you can peel off the freezer paper from the front and admire your work! Heat set the paint with your iron if the instructions on the paint say so. Alternative: Transfer the shape of the letters from the roof pattern to the fabric and embroider the letters on the roof. I made a very simple embroidery example, but you can be as creative as you like with this. If you embroider you will need a bit more fabric so an embroidery hoop can hold the fabric. In this case also make sure you add a ¼” seam allowance all around the pattern piece before you cut the roof shape from the fabric. The diagonal line will follow from these measurements. Add a ¼” seam allowance to all sides of this shape. Now cut out the shape, et voilà, that’s your template! Cut one piece of fabric for the left side with the template like you drew it. Turn the template over to the back to cut the fabric for the right side of the roof. Sew both these pieces of fabric to the diagonal sides of the roof piece with a ¼” seam. Press seams open. Trim to 3.5” x 12.5”. This strip includes the piles of fabric on the market stall. For this you can use tiny bits of fabric. I recommend that you iron them, so they are easy to use. The pattern for the piles of fabric is on the first page of the pattern pdf. The rectangles on the pattern with a capital letter (for example A3; these are also the colored rectangles) are to be cut from colorful scraps to make up the different fabrics on the market stall. B4, C2, and E4 can be price signs. The rectangles with lowercase letters (for example b1) are to be cut from background fabric. There are two methods to cut all those little pieces from your fabric. 1. Look on the pattern to see what the finished size of a piece is supposed to be (you can measure or use the scale I have provided on the pattern), ADD ¼” SEAM ALLOWANCE ON ALL SIDES and cut from the fabric scrap. Or 2. Print the pattern on a sheet of freezer paper, cut all the rectangles apart, iron them onto your scraps and cut around the freezer paper ADDING ¼” SEAM ALLOWANCE ON ALL SIDES. In this case it is handy to also print a copy of the pattern on regular paper as reference for placement. Sewing the bits together: When you look at the pattern you see it is made up out of 5 sections, A through E. You construct each section separately and then sew them together. Sections A and E are the easiest with only horizontal seams. B and C have a couple of vertical seams, sew those first. Then you sew the remaining horizontal seams. Section D is the trickiest. First sew the seam between D1 and D2 before attaching them to D3. Then sew the seam between D4 and D5. Then sew between D6 and D8 and attach to d1. Then the seam between D9 and d2, and attach that to D7. Now sew the two bits you made last to one another. Go on by sewing d3 and d4 to D10. And d5 and d6 to D11. Now you’re left with only horizontal seams to complete this section. After you have sewn all the pieces and sections together you should have a patchwork that measures 4.5” x 7.5”. The last steps to complete this strip of the block: From fabric for the structure of the market stall (I used the black wordy fabric) cut 2 pieces measuring 4.5”x 1” and sew them to the short sides of the patchwork with a ¼” seam. From background fabric add 2 pieces of 4.5” x 2.5” , one on each side, also with a ¼” seam. You should end up with a strip measuring 4.5” x 12.5”. I’ll give you the measurements of the fabric you need including the ¼” seam allowance. Please refer to the photos of the block and the strips for their placement. After making all 6 strips, sew them together. There is your block! I hope you’ll have fun with this pattern! If you make this block, show it off in the Flickr group. I would love to see it! 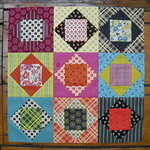 Fabrics to make this block and all the others of our quilt-a-long were very generously sponsored by the Fat Quarter Shop. Thank you!! These are some of the fabrics I used: Ruby cotton lime sundae for the roof, Curio Pond Cabriole for the decorative strip along the bottom of the roof, Lost and Found Black labels for the market stall structure, Kona Ice frappe for the background. 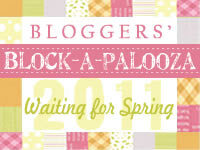 The schedule for the quilt-a-long can be found here. Next week Susanne will have a great block for you!